Historically, QC-CALC has been used within an individual inspection machine as a single copy of software with individual settings. As modern inspection devices have been increasingly placed on the internal network, there is now a greater need to share the individual settings across multiple PCs. The Administrative Tool was created to do just that. It centrally controls the settings and privileges of the individual copies of QC-CALC running throughout the shop. Through the creation of groups, administrators can define which copies have access to the various settings and functionality in QC-CALC. These settings can easily be changed from any of the participating copies of QC-CALC with the use of an administrative password. 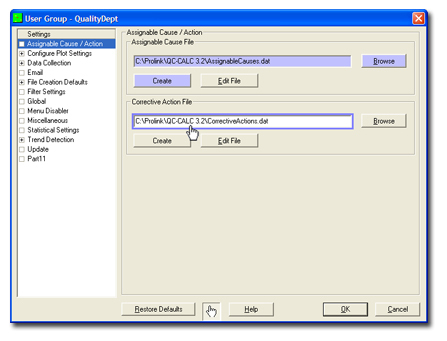 The picture at left shows an administrator setting and locking the paths to the assignable cause and corrective action files for all copies of QC-CALC in the QualityDept group. When not being used in Administrative mode, all features within the application can be locked and password protected to stop unwanted changes to the data. All products support the following languages: English, French, German, Italian, Polish, Russian, Spanish, Swedish, and Chinese (simplified). QC-CALC comes with a built-in report designer, which means you can edit and change the templates of the various reports to suit your company's needs. You can even create new templates. With the existing templates, we typically send a lot more data to the report than is actually used. This allows maximum flexibility if you need to see different calculations, etc in the reports.